1. 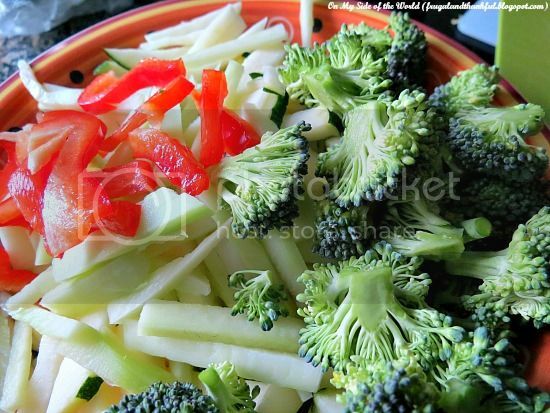 Cut your vegetables (carrots, peppers and zucchinis into strips, broccoli separate into smaller florets etc.). Chop onion. 2. Heat oil in a large skillet over medium heat. Stir in the garlic and onion; cook while stirring until the onion has softened and turned translucent, about 5 minutes. 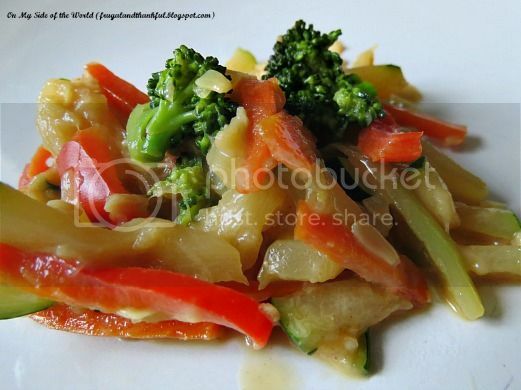 Add other veggies and cook until tender, for about 6-8 minutes. 3. 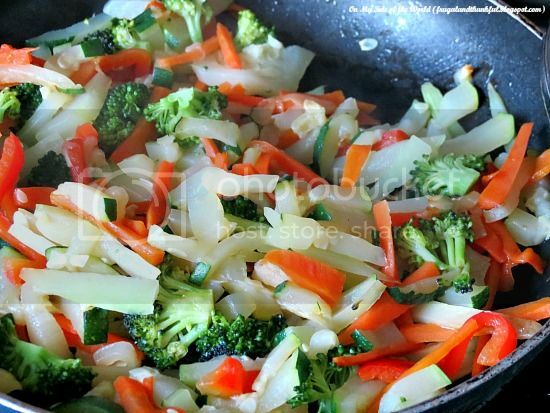 While veggies are cooking, whisk together water and cornstarch, then add soy sauce, honey, pepper flakes and peanut butter. Add to vegetables in the skillet and cook for another 5 minutes or so, or until the sauce thickens. That's it! This recipe is very forgiving. You can adjust the ingredients to your taste but we love it the way it is. I also made it with smooth peanut butter and it tastes just as good, just a little less texture. Yum! Now I want to go and make some again :) You can also add some cooked chicken and serve with jasmine rice for a full meal. Yum! I love stir fry! I always have to add some meat for my meat loving daughter. But it's great that I can have all the veggies if I want. Thanks for sharing that recipe! Mmmm sounds unbelievably scrumptious….taking note!!! I don't do a formal sauce when I do stir fry-just add a little soy sauce. I'll have to give your peanut butter sauce a try. Thanks Lena, that looks so delicious..plus I have all the ingredients. That's why I like this recipe so much - I always have the ingredients on hand. I am going to make this this week!